Tess Mize is a freelance writer, Navy wife, and new mom. Aside from being an avid royal watcher and Anglophile, she loves literature, theatre, yoga, and a good glass of wine. She was raised in the Southeast but currently lives in California with her husband, daughter, and dog. First of all, welcome back to Kate’s Sitting Room! We took a bit of a summer hiatus, but we’re very excited to be back! Without further ado, here’s the long-awaited post on thank you notes. Few acts of consideration make as big an impact—and are as simple—as writing thank you notes. I remember being taught to write thank-you notes as soon as I could write, whether I was simply signing my own name to a message my mother had written or composing a note by myself. As I got a bit older and computers became a bigger part of my daily life, I typed my messages for awhile, but always hand wrote my signature and possibly drew a little picture. The week or so after my birthday or Christmas was sometimes challenging, with my mother nagging me to finish writing notes to family and friends who had given me presents. It may have taken me longer than she would have liked, but eventually I finished. Now, as an adult, I have a slight compulsion with making sure I acknowledge gifts with a hand-written note. As we all know, royals send thank you notes, too! Most of us have seen the cards sent on behalf of various royals thanking people for wishes sent on the occasion of a birthday or anniversary. They’re typically a photo card of some sort, with a short couple of sentences and a reproduction of the royals’ signature. I expect that family and friends of royals receive more personal (and probably hand-written) notes than they send to members of the general public. Some of us may choose to go the photo card route for big events, like a wedding, but a personal note is still de rigeur (and, honestly, expected) for us commoners. Since we can’t know exactly what royals like Kate might write in a personal note, I’ll just have to do my best to advise on how to write a thank you note that your recipients will think could have come from royalty. The only times I’ve really struggled with writing personal thank you notes, not coincidentally, followed the biggest events in my adult life: high school and college graduations, my wedding, and the arrival of my first child. I don’t have an estimate for how many gifts I received for my graduations, but I can say with relative certainty that the numbers for my wedding and baby numbered over a hundred each. When you’re dealing with that kind of volume, the very first step is to take a moment before you get overwhelmed imagining the impending hand cramps and be so, so very grateful. If I ever start to resent writing thank you notes, I have to pause and remind myself just how lucky I am to have so many people in my life who care enough about me and my family to send a gift. True appreciation sets the stage for the most sincere thank you note. With that in mind, here are a few tips for writing the perfect royal thank you note. Tip #1: Treat yourself to some fun stationery! I have a slight addiction to every kind of stationery, but my favorite thing to do is order special personalized notes to use for this kind of correspondence. Having fun, new cards can offer some motivation to get to work. Tip #2: If you’re dealing with high volume output, it’s best to break it up into several sessions. Don’t try to write 150 thank you notes from your wedding in one sitting! Tip #3: Make it personal. Obviously, refer to the specific gift you received (keeping a list is helpful here), but also make note of how much fun you had with the person at the event in question. How much it meant to you to have that person at your wedding, or birthday party. How much you missed them if they weren’t there. How much you’re looking forward to seeing them again. The gift isn’t the most important thing—how much you value your relationship with the giver should be the focus. Tip #4: Mail them out as you get them done. Don’t let the first ones finished sit around gathering dust while you finish the rest. It feels really good to put a stack of letters in the mailbox, but seeing the check marks on your list and knowing you’re making progress can go even farther in keeping the motivation going. Tip #5: A late note is better than no note at all. If you’ve procrastinated, or simply forgot about it, it’s never too late to acknowledge an appreciated gift or act of hospitality! I hope these tips are helpful! Have any of you received a thank you note from a royal? Share your stories! Also, please let me know what other royal subject (see what I did there?) you’d like me to cover next. Lovely article, Tess! I love the ‘Kate’s Sitting Room’ posts. Maybe you could write about how the kids will be referred to in school? 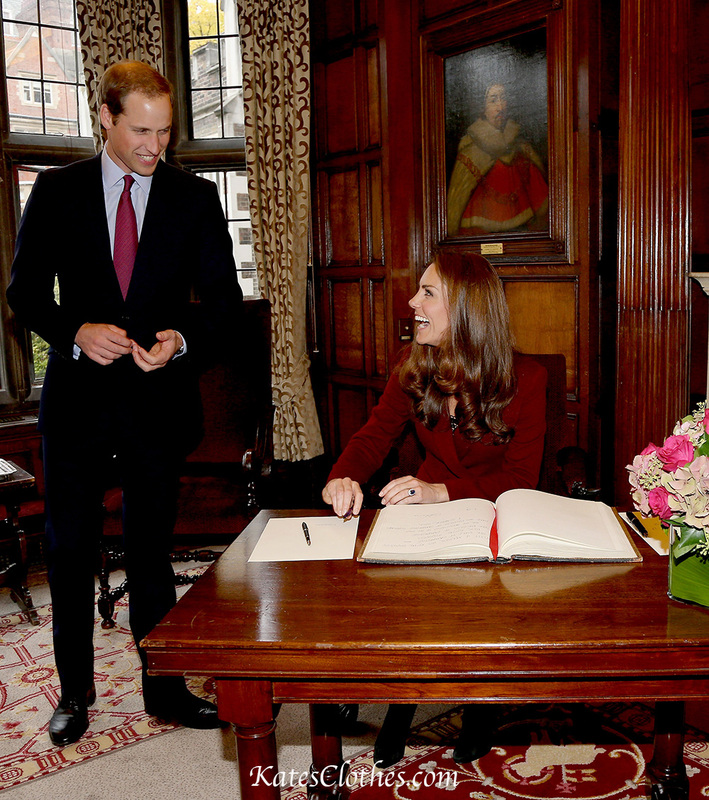 Or how to write a letter to Kate (for their wedding anniversary,…)? I have one particular childhood memory when I had to write so many thank you cards my hand hurt for 2 days after my first holy communion, my mother made me write a card for every relative who had celebrated with me and/or given me a present. We attached a photo of me in the white dress to the card and inside, I wrote with a golden pen (I remember being really careful so that I did not blur the ink with my hand). After I had finished, my hand really hurt, but it was such an important gesture. My aunt and my grandmother still have these cards standing on a sideboard with family photographs in the living room! So what I want to express with this story: you are so right, it really shows your dear ones how much you appreciate them. And in times of texting, we should not stop sending hand-written thank you cards! Hi Sonja! So glad you enjoy the column! Thanks for your story…a gold pen sounds super fancy! I’ll add those topics to my list and see if I can come up with a decent amount of material for this space. Great topics – especially titles to use WHEN writing the letter to TRHs. I’ve seen such articles, about addressing them directly: very involved and confusing. Fortunately, TRHs aren’t stuffy, so I suspect any unintentional gaffs would be ok – they’ll probably laugh it off. I am also addicted to fun stationery. (Funtionery?) But, since I rarely write anything to anyone without a computer, I no longer purchase same – unless it’s holiday computer paper and the like. Microsoft Publisher is fun for creating stationery and cards: I’ve done it, and it’s a great substitute…and lots easier than just using Word and a bunch of clip art. Hi Alejandra! Thanks so much for the kind comments…I’ve observed that thank you notes aren’t common everywhere, but I can’t imagine they wouldn’t be appreciated, even if it’s not the usual thing. A sweet gesture is always appreciated! Great article! My sister is currently furious with her granddaughter for not thanking me for her high school graduation present. I hardly know the young woman, and I sent her a check, so I only really needed to know if she received it and called my sister/her grandmother to make sure. Now, my nieces and nephews acknowledging a gift from me: THAT’S another story! We have a relationship, and I usually shop and wrap carefully thought-out presents for them! As children, my sisters and I received a packet of thank you cards in our Christmas stockings every year (a very polite Santa) alongside an assortment of candy, jewelry, toys…and emery boards. (LOL!) These days, I usually call to thank people for gifts, unless it’s something unusual (Like a totally unexpected $200 to pay for the cd I needed to make.) or for gifts during life-changing occasions. I once left a thank you note under my uncle’s/godfather’s pillow when I stayed with him and my aunt one summer. (He talked about that for years.) Mostly, I send thank you notes as loving appreciation for a relative or friend’s kindness – a kind of hug. The very best thank you note I ever got was as a child, though – and I still have it. When President Kennedy was assassinated (I’m a Yank. ), my neighbors and I put on a carnival in their backyard to benefit the presidential library. We didn’t make a lot, but we had a ball and were really happy to send the money and a letter to Jackie Kennedy. We must have each signed the letter, because Mrs. Kennedy sent EACH of us a thank you note on black-edged stationery with her signature. I am still amazed to this day! I have written to the royal family many times since the wedding, and found out by Google the do’s and don’ts on how, when, what, and where to send each letter. It always takes the longest to hear back from HM the Queen, as should be expected but you’re correct.I’ve always received a picture with a few lines about how they appreciate the kind words and thoughts surrounding the birth of Prince George, Princess Charlotte, bday wishes,wedding and anniversaries etc.. I love it so simple and so very unique as well.. Not just everyone can say they’ve received a letter from HM, William, Kate etc!! !